We are happy to announce that Oliver Zettinig received the 3rd Best Student Paper Award at ISBI 2017 for his work "Preconditioned Intensity-Based Prostate Registration using Statistical Deformation Models", co-authored by J. Rackerseder, B. Lentes, T. Maurer, K. Westenfelder, M. Eiber, B. Frisch, and N. Navab. Congratulations! 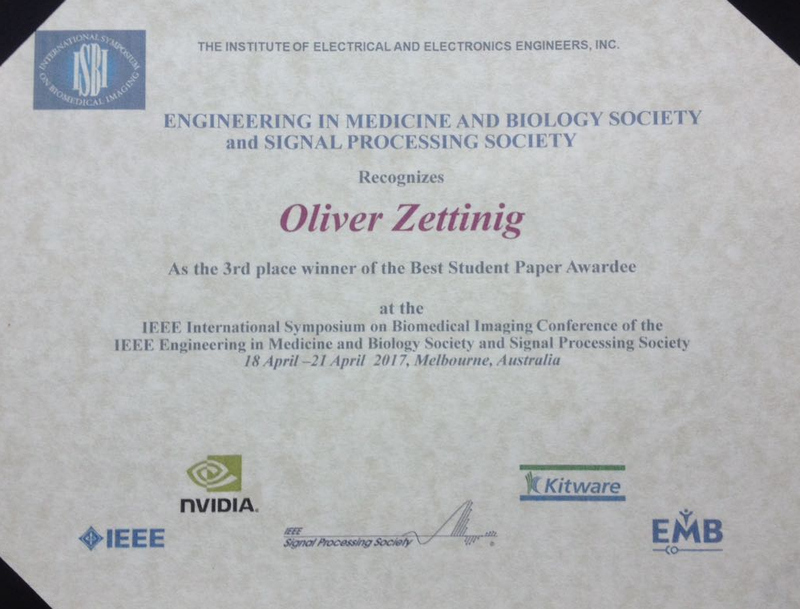 Abstract: We are happy to announce that Oliver Zettinig received the 3rd Best Student Paper Award at ISBI 2017 for his work Preconditioned Intensity-Based Prostate Registration using Statistical Deformation Models. Congratulations!